When Father Bennis is shot while presiding over mass, he ends up in the hospital with a dead man's head and a bloody knife in his bed. Someone is out to make a statement, and it involves Father Bennis. Detective Adriana Perez, a feisty somewhat overly aggressive individual, firmly believes all clues lead to Father Bennis, yet at the same time she harbors extreme hatred for his brother, who might have caused her sister’s death. Regardless of what clues police have, or what thoughts or attempts at discovery the brothers have, more and more innocent Muslims are killed and decapitated. Everyone seems to convene at the local pub, O’Malley’s, where they all share their opinions about "who done it." Finn McCool, the bartender, is more vocal than most and seems to enjoy riling others up about the topic. Eventually, Father Bennis gets curious as to why no one can find information about McCool and decides on his own to take a trip to Ireland to see what he can find out. As more evidence comes in, Detective Perez and Cavanaugh call a truce and explore new information about McCool. Not having read the series in order, I felt quite at home with the characters and action. From Hopkins, the previously well-laid foundation of the description of the main characters made it feel like I was home again. His plot is powerful and pulls you in from the first page. He provides you with just enough information to give you a sense he knows what he is talking about and sets you up as the "armchair" detective. I liked that the words and action flowed smoothly, and just when you think you have the case solved – “bam” he’s gotcha going in another direction. One character that evoked strong emotions from me was Detective Perez. I can’t tell you how many times I wanted to smack her and say, "Get over it!" I think that when an author can get you to react in that way, he/she has done a great job of writing. Again, you can tell Hopkins has done his work, and I liked the fact that he had law enforcement admitting that they often make mistakes. 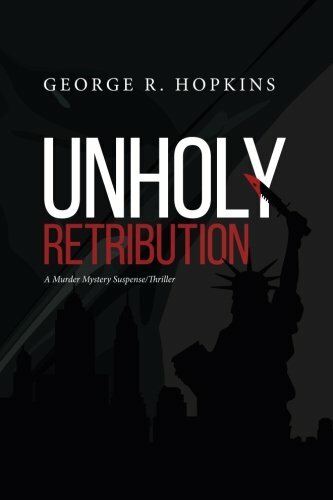 I highly recommend “Unholy Retribution” by George Hopkins to anyone who wants to be drawn into a world of fast action, romance, and thrills.